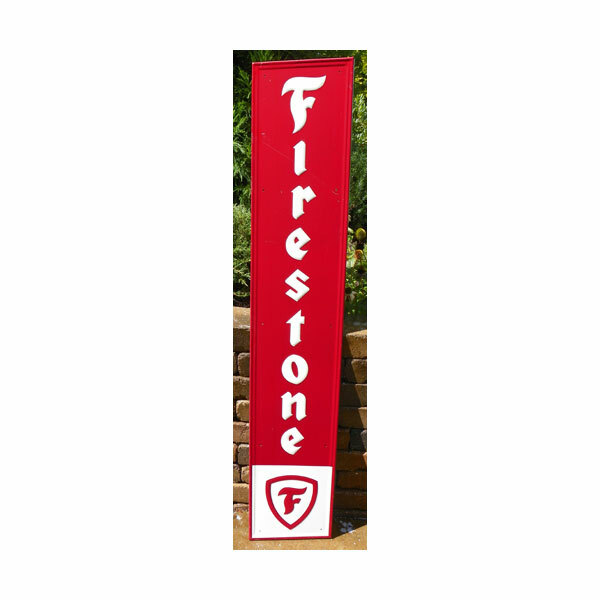 VERY DESIRABLE VERTICAL SIGN THAT TAKES LITTLE SPACE TO DISPLAY. THIS “MUSCLE CAR ERA” FIRESTONE TIRES VERTICAL SIGN IS GUARANTEED 100% ORIGINAL, OLD AND is NEW OLD STOCK. NEVER USED. Made of Painted metal with EMBOSSED lettering. 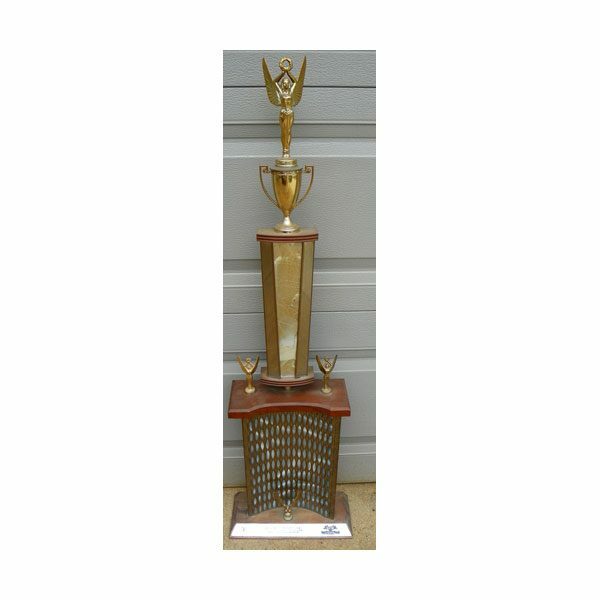 Measures 72″ X 14″. DISPLAYS GREAT. Very Colorful. SUPER CLEAN. This sign has just a few tiny scratches and minuscule nicks but still displays well. AS CLOSE TO MINT CONDITION AS POSSIBLE FOR A SIGN THIS OLD. 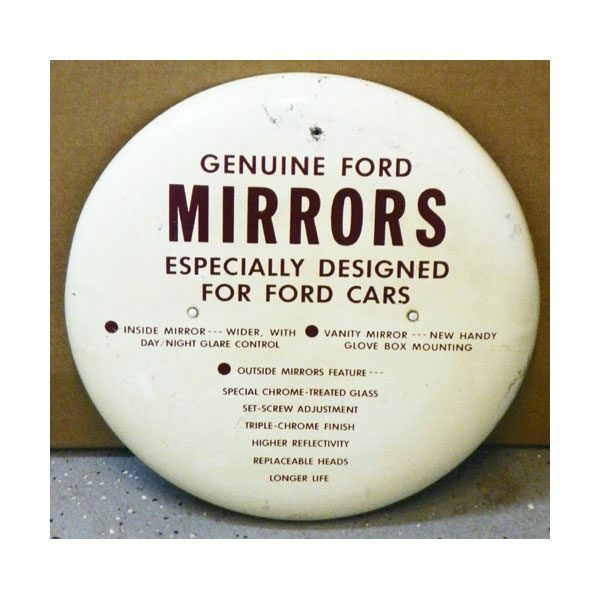 THIS SELDOM FOUND 1950’s FORD CAR MIRROR DISPLAY BUTTON SIGN WAS USED BY 1950’s FORD DEALERSHIP SHOWROOMS TO PROMO & DISPLAY FORD MIRRORS IN THE LATE 1950’s. GUARANTEED ORIGINAL AND OLD. GREAT ITEM THAT IS VERY HARD TO FIND. Factory made by the same Sign company that made the iconic Coca Cola button signs. This Ford Button Sign appears to be the same “blank” as originally used by Coca Cola. 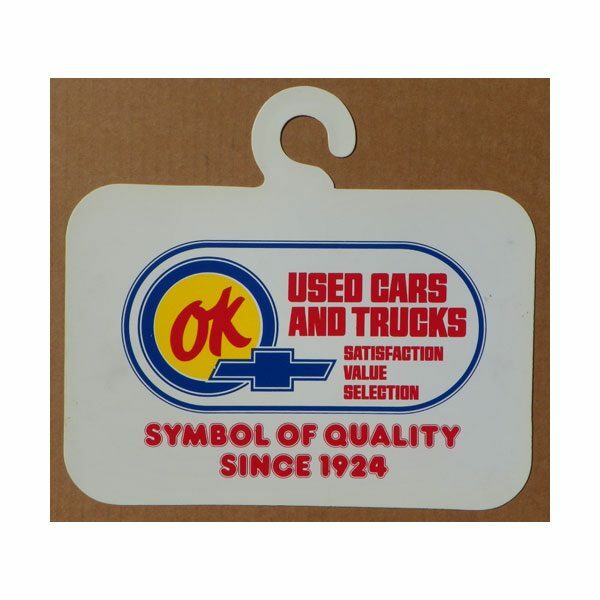 GREAT ITEM THAT IS VERY HARD TO FIND and is GUARANTEED ORIGINAL AND OLD. This FORD BUTTON SIGN has just the right “period correct” old look. Made of painted metal. Has minor age wear, soil, minor discoloration, nicks and minor scratches, minor shallow dents, one non original mounting hole, minor paint loss, back needs cleaning but nothing serious at all. Measures 12″ in diameter. 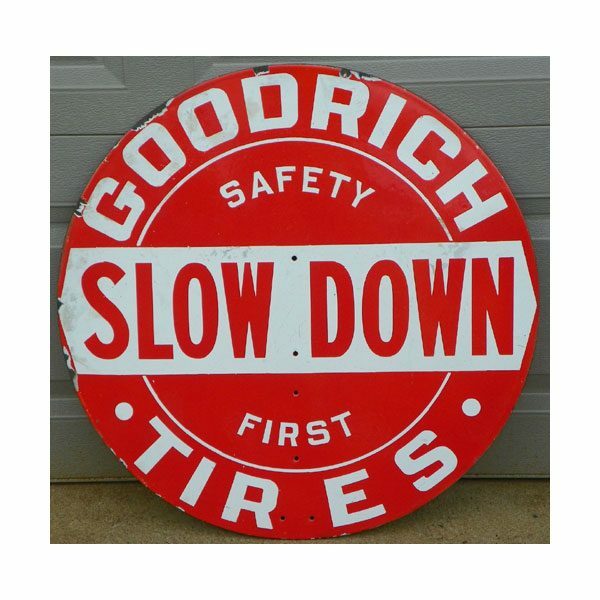 Here’s a DESIRABLE AND HARD TO FIND 1930’s GOODRICH TIRES SLOW DOWN SAFETY FIRST PORCELAIN SIGN that is GUARANTEED 100% ORIGINAL AND OLD. Made of Very Heavy PORCELAIN over Metal. Single side. This sign still displays STRONG for its age. Excellent Condition. Sign has a few very minor scratches and chips but nothing too serious at all. No touch-up, just all original. The SIGN still displays very well.